Tony was an extremely talented and successful athlete of the 1970s excelling particularly in the long jump, 100m and 200m over his athletics career, representing Fiji at the South Pacific Games, the Commonwealth Games and the Olympic Games. In 1971 Tony became the Fiji National Champion in three disciplines – long jump, 100m and 200m – a crown that he wore through to 1974 and probably would have continued to wear, had he not moved to Australia in 1975. Tony’s name has been in the Long Jump record books for many years. His Personal Best performance came at the Commonwealth Games in 1974 in Christchurch, New Zealand. Tony’s qualifying Long Jump of 7.65m was a South Pacific record, which remained intact for 25 years, a Fiji National record, which remained for an even more staggering 29 years, and also earned him a spot in the finals. He unfortunately sprained his ankle on the first jump of the final and was carried from the track on a stretcher. 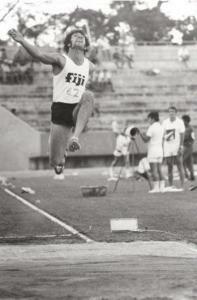 The following year, Tony won Gold in the Long Jump at the 1975 South Pacific Games in Guam with a jump of 7.36m. In poor, wet conditions, Tony somehow managed an impressive leap which set a SPG record that stood for 12 years. Tony went on to represent Fiji at the 1976 Montreal Olympic Games in four events – the 100m, 200m, 400m and Long Jump, reaching the quarter finals in the 200m. He was also chosen to serve as the Chef de Mission for the Games, at just 24 years of age. Tony retired from competitive athletics in 1977, but his involvement in sport has continued. In 2000 he had the “truly amazing experience” of participating in the Olympic Torch Relay. He continues to speak about sport and the Olympic Movement at schools, hospitals, nursing homes and service clubs and throughout his athletic career Tony demonstrated the Olympic Values of Excellence, Friendship and Respect. In 2008 his interest in writing saw him inducted into the Art of the Olympians museum in Florida, USA as the Museum’s inaugural poet.